Morbo hosting Channel √2 News, in 3010. [6ACV04] The story is the death of Jim. Morbo the Annihilator is one of the little known species of yellow-eyed aliens with gigantic heads, the husband of Fawn, and the father of her numerous belligerent offspring. He is also a widely known television presenter. Morbo started as a reporter in Los Angeles, and now co-hosts several shows on Channel √2, most prominently, the news, with Linda van Schoonhoven, with whom he maintains a relationship that is at least odd. A violent alien and a good friend of President Richard Nixon, he is also obsessed with taking over Earth, mentioning it very frequently. Apparently, he is the scout of an impending alien invasion, although it is possible that his evil is just an act used to increase ratings. Morbo always refers to himself in the third person, and his exposed torso is terrifying beyond imagination. He seems to treat Linda with contempt, the same way he would treat any other Human. However, a deleted scene of Into the Wild Green Yonder shows that he was visibly upset that she was no longer around, and violently shook the camera, which could imply that he cares for her to a degree. He also comforted her when she broke down in tears due to suffering from alcohol withdrawal. As seen in the game. 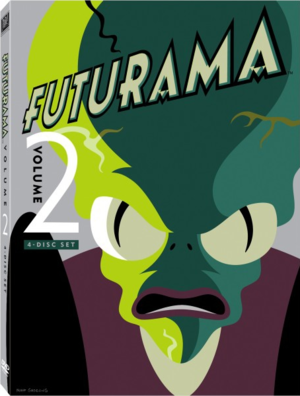 The cover for the re-issue of Volume Two. Morbo is one of the few non-primary characters who appear in every film. He is featured on the cover for the re-issue of Volume Two. He has been known to sing karaoke. His skills appear rather sub-par, but no one seems to notice (or are too afraid of offending him in any way). His name is on the Walk of Fame in Los Angeles. In several episodes, Linda newscasts alone. According to the commentaries, this is because the writers leave him out of episodes that have a large focus on aliens. Morbo: Puny Earthlings were shocked today to learn that a gigantic ball of garbage will destroy their pathetic city of New New York. Linda: In all, this is one day Mittens the Kitten won't soon forget. Morbo: [Laughs.] Kittens give Morbo gas. Morbo: In lighter news, the city of New New York is doomed. Linda: [Referring to the turtles migrating to Holland.] I'm sure those windmills will keep them cool. Morbo: [to Linda] Windmills do not work that way! [to viewers] Goodnight! Morbo: All humans are vermin in the eyes of Morbo. Morbo: [to Fawn] Stop it, stop it. It's fine. I will destroy you. Morbo: Morbo will now introduce tonight's candidates. Puny human number one, puny human number two and Morbo's good friend, Richard Nixon. Nixon's head: Hello, Morbo. How's the family? Morbo: Morbo congratulates our gargantuan cyborg president. May death come quickly to his enemies! Linda: Why do you always get to read the top story, Morbo? Morbo: Our top story, the universe's most wanted eco-feminists are now behind bars, including gang leader Turanga Leela, AKA the notorious B. I. Itch. Morbo: At the risk of editorializing, this reporter applauds the demise of the pathetic human species! Morbo: Morbo can't understand his teleprompter because he forgot how you say that letter that's shaped like a man wearing a hat. Linda: It's a T. It goes "tuh". Morbo: Hello, little man. I will destroy you! This page was last edited on 17 September 2017, at 23:48.